Brazos Wind Ranch in Texas. Wind power in the United States is a branch of the energy industry that has expanded quickly over the latest several years. For the twelve months through November 2017, 254.2 terawatt-hours were generated by wind power, or 6.33% of all generated electrical energy. As of January 2017, the total installed wind power nameplate generating capacity in the United States was 82,183 megawatts (MW). This capacity is exceeded only by China and the European Union. Thus far, wind power's largest growth in capacity was in 2012, when 11,895 MW of wind power was installed, representing 26.5% of new power capacity. In 2016, Nebraska became the eighteenth state to have installed over 1,000 MW of wind power capacity.Texas, with over 22,000 MW of capacity, about 15% of the state's electricity usage, had the most installed wind power capacity of any U.S. state at the end of 2018. Texas also had more under construction than any other state currently has installed. The state generating the highest percentage of energy from wind power is Iowa, while North Dakota has the most per capita wind generation. The Alta Wind Energy Center in California is the largest wind farm in the United States with a capacity of 1,548 MW.GE Power is the largest domestic wind turbine manufacturer. Map illustrating installed wind generating capacity for U.S. states at end of 2018. Compare with wind potential map. The first municipal use of multiple wind-electric turbines in the USA may have been a five turbine system in Pettibone, North Dakota in 1940. These were commercial Wincharger units on guyed towers. In 1980 the world's first wind farm, consisting of twenty 30 kW wind turbines was installed at Crotched Mountain, in New Hampshire. From 1974 through the mid-1980s the United States government worked with industry to advance the technology and enable large commercial wind turbines. A series of NASA wind turbines were developed under a program to create a utility-scale wind turbine industry in the U.S., with funding from the National Science Foundation and later the United States Department of Energy (DOE). A total of 13 experimental wind turbines were put into operation, in four major wind turbine designs. This research and development program pioneered many of the multi-megawatt turbine technologies in use today, including: steel tube towers, variable-speed generators, composite blade materials, partial-span pitch control, as well as aerodynamic, structural, and acoustic engineering design capabilities. Later, in the 1980s, California provided tax rebates for wind power. These rebates funded the first major use of wind power for utility electric power. These machines, gathered in large wind parks such as at Altamont Pass would be considered small and un-economic by modern wind power development standards. In 1985 half of the world's wind energy was generated at Altamont Pass. By the end of 1986 about 6,700 wind turbines, mostly less than 100 kW, had been installed at Altamont, at a cost of about $1 billion, and generated about 550 million kWh/year. A 2012 report by a clean energy consulting group concluded that new wind farms can produce electric power in the 5-8 cents per kWh range, making wind power cost-competitive with fossil fuels in many areas. As of 2013, the US Energy Information Administration estimates the "levelized cost" of wind energy from new installations as 7 to 10 cents per kWh, depending on the geographic area, but cautioned that levelized costs of non-dispatchable sources such as wind should be compared to the avoided energy cost rather than the levelized cost of dispatchable sources such as natural gas, or baseload sources such as coal or geothermal. [page needed] In 2015, a Koch-funded institute of Utah State University stated that the cost of wind energy is higher than most cost estimates calculate. Renewable portfolio standards require renewable energy to exist (most of them intermittent such as wind and solar), but at the expense of utilities and consumers. The production tax credit makes wind power cheaper for utilities and consumers, but at the expense of taxpayers. The American Wind Energy Association has criticized the study of lacking comparison with pollution and subsidies incurred by other electric power sources, and for counting transmission as a cost rather than a benefit. Monthly wind electric power generation in the US, 2007-2015. Average monthly capacity factors for electric power generation by utility-scale wind turbines in the United States, 2011-2015 (US Energy Information Administration data). As of 2017, the United States has over 82 GW of installed wind power capacity. 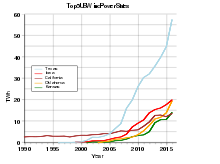 Wind power has increased dramatically over the past years. In 2010, however, newly installed generating capacity was about half of the previous year due to various factors, including the financial crisis, and recession. In 2013 there was a 92% reduction in newly installed generating capacity compared to 2012, due to the late extension of the PTC (see image on the right). The graph at left shows the growth in installed wind generation capacity in the United States based on data from the Office of Energy Efficiency and Renewable Energy. In 2008, installed capacity in the U.S. increased by 50% over the prior year. The world average growth rate that year was 28.8%. By 2014, the wind industry in the USA was able to produce more power at lower cost by using taller wind turbines with longer blades, capturing the faster winds at higher elevations. This opened up new opportunities and in Indiana, Michigan, and Ohio, the price of power from wind turbines built 300 feet to 400 feet above the ground competed with conventional fossil fuels like coal. Prices had fallen to about 4 cents per kilowatt-hour in some cases and utilities had been increasing the amount of wind energy in their portfolio, saying it is their cheapest option. For power contracts made in the year 2014, the average price of wind power fell to 2.5¢/kWh. The capacity factor is the ratio of power actually produced divided by the nameplate capacity of the turbines. The overall average capacity factor for wind generation in the US increased from 31.7% in 2008, to 32.3% in 2013. According to the National Renewable Energy Laboratory, the contiguous United States has the potential for 10,459 GW of onshore wind power. The capacity could generate 37 petawatt-hours (PW·h) annually, an amount nine times larger than current total U.S. electricity consumption. The U.S. also has large wind resources in Alaska, and Hawaii. In addition to the large onshore wind resources, the U.S. has large offshore wind power potential, with another NREL report released in September 2010 showing that the U.S. has 4,150 GW of potential offshore wind power nameplate capacity, an amount 4 times that of the country's 2008 installed capacity from all sources, of 1,010 GW. The U.S. Department of Energy’s 2008 report 20% Wind Energy by 2030 envisioned that wind power could supply 20% of all U.S. electric power, which included a contribution of 4% to the nation’s total electric power from offshore wind power. In order to achieve this, however, significant advances in cost, performance and reliability are needed, based on a 2011 report from a coalition of researchers from universities, industry, and government, supported by the Atkinson Center for a Sustainable Future. Obtaining 20% from wind requires about 305 GW of wind turbines, an increase of 16 GW/year after 2018, or an average increase of 14.6%/year, and transmission line improvements. Analysts estimate around 25 GW of added US wind power in 2016-18, depending on the Clean Power Plan and PTC extensions. After the current PTC phase-out in 2021, additional wind power capacity is expected to be around 5 GW per year. In 2015, electric power generation from wind power was 10 percent or more in twelve U.S. states: Colorado, Idaho, Iowa, Kansas, Maine, Minnesota, North Dakota, Oklahoma, Oregon, and South Dakota, Vermont, and Texas. Iowa, South Dakota, and Kansas each had more than 20 percent of their electric power generation come from wind. Twenty states now have more than five percent of their generation coming from wind. Fourteen states now have 10 percent or more of their generation coming from wind power. Most of these are in the central plains. These states include North Dakota, South Dakota, Minnesota, Iowa, Nebraska, Colorado, Kansas, Oklahoma, New Mexico, Texas, Maine, Vermont, Oregon, and Idaho. In July 2008, Texas approved a $4.93 billion expansion of the state's electric grid to bring wind energy to its major cities from western areas of the state. Transmission companies will recoup the cost of constructing the new power lines, expected to be completed in 2013, from fees estimated at $4 per month for residential customers. A lack of transmission capacity forced wind turbines to be shut down at times and reduced wind power generation in Texas by 17% in 2009. The Roscoe Wind Farm in Roscoe, Texas, Texas's largest wind farm with 627 wind turbines and a total installed capacity of 781.5 MW, surpassed the nearby 735.5 MW Horse Hollow Wind Energy Center. It is located about 200 miles (320 km) west of Fort Worth and the wind farm area spans parts of four Texas counties. Wind power in California has doubled in capacity since 2002. With a total of nearly 4,000 megawatts installed, as of the end of 2011, wind energy now supplies about 5% of California’s total electric power needs, or enough to power more than 400,000 households. The amount varies greatly from day to day. In 2011, 921.3 megawatts were installed. Most of that activity occurred in the Tehachapi area of Kern County, with some big projects in Solano, Contra Costa and Riverside counties as well. After 2014, California ranked second nationwide in terms of capacity, behind Texas with a capacity of 5,917 MW. Large portions of California's wind output, are located in three primary regions: Altamont Pass Wind Farm (east of San Francisco); Tehachapi Pass Wind Farm (south east of Bakersfield), and San Gorgonio Pass Wind Farm (near Palm Springs, east of Los Angeles). The giant new Alta Wind Energy Center, is also located within the Tehachapi Pass region. State wind generation percentages for 2017. Five states exceeded 25% of generation. More than 35 percent of the electric power generated in Iowa now comes from wind power. Iowa had over 6900 megawatts (MW) of generation capacity at the end of 2016. Electrical energy generated in Iowa by wind in 2014 amounted to over 16 million Megawatt-hours. Since Iowa adopted a renewable energy standard in 1983, the wind power industry has generated over $10 billion in investment. The second concrete wind turbine tower to be built in the U.S., and also the country's tallest (377 feet) at the time built, is in Adams county. The tower was completed in the spring of 2016. In 2018, Invenergy announced it plans to develop a pair of wind farms in Iowa. Each farm will be capable of generating 200 MW. Construction is planned to begin in early 2019. Oklahoma has one of the best resources in the United States. Bergey Windpower, a leading manufacturer of small wind turbines is located in Oklahoma. Programs leading to careers in the wind power industry are provided at tech schools, community colleges and universities in Oklahoma. The Oklahoma Wind Power Initiative supports the development of wind power in the state. The average monthly per person wind generation for the top 20 U.S. states is shown. For reference, the average monthly residential electricity use in the U.S. is about 900 kW-hours. Wind power has been supported by a renewable portfolio standard, passed in 2007, and strengthened in 2009, which requires 10% renewable energy from electric companies by 2010 and 25% by 2025. Illinois has the potential for installing up to an estimated 249,882 MW of wind generation capacity at a hub height of 80 meters. In 2012, Kansas saw a large number of wind projects completed making it among the largest and fastest growing wind energy markets. At the end of 2014 the total capacity sits at 2,967 MW. Kansas has high potential capacity for wind power, second behind Texas. The most recent estimates are that Kansas has a potential for 950 GW of wind power capacity. Kansas could generate 3,900 TW·h of electric power each year, which represents more than all the electric power generated from coal, natural gas and nuclear combined in the United States in 2011. Levelized wind Power purchase agreement prices by PPA execution date and region. Since 2005 many turbine manufacturing leaders have opened U.S. facilities; of the top 10 global manufacturers in 2007, seven – Vestas, GE Energy, Gamesa, Suzlon, Siemens, Acciona, and Nordex – have an American manufacturing presence. REpower is another manufacturer with notable usage in the United States. Plans for 30 new manufacturing facilities were announced in 2008, and the wind industry expects to see a continued shift towards domestic manufacturing in the coming years. In total, 70 manufacturing facilities have begun production, been expanded, or announced since January 2007. As of April 2009, over 100 companies are producing components for wind turbines, employing thousands of workers in the manufacture of parts as varied as towers, composite blades, bearings and gears. Many existing companies in traditional manufacturing states have retooled to enter the wind industry. Their manufacturing facilities are spread across 40 states, employing workers from the Southeast to the Steel Belt, to the Great Plains and on to the Pacific Northwest. The U.S. Department of Energy (DOE) is working with six leading wind turbine manufacturers towards achieving 20% wind power in the United States by 2030. The DOE announced the Memorandum of Understanding (MOU) with GE Energy, Siemens Power Generation, Vestas Wind Systems, Clipper Windpower, Suzlon Energy, and Gamesa Corporation. Under the MOU, the DOE and the six manufacturers will collaborate to gather and exchange information relating to five major areas: research and development related to turbine reliability and operability; siting strategies for wind power facilities; standards development for turbine certification and universal interconnection of wind turbines; manufacturing advances in design, process automation, and fabrication techniques; and workforce development. In 2014, GE had 60%, Siemens had 26%, and Vestas had 12% of US market share. Combined, they had 98%. Most new turbines were designed for low wind. The turbine manufacturers compete with each other and cause decreasing turbine prices. The DOE's National Renewable Energy Laboratory (NREL) has announced a number of wind technology projects, including a new state-of-the-art wind turbine blade test facility to be built in Ingleside, Texas. The Texas-NREL Large Blade Research and Test Facility will be capable of testing blades as long as 70 meters (230 feet). It will be built and operated through a partnership among NREL, DOE, and a state consortium led by University of Houston, with the university owning and operating the facility's buildings, DOE funding up to $2 million in capital costs, and NREL providing technical and operational assistance. The blade test facility is estimated to cost between $12 million and $15 million and should be completed by 2010. Located on the Gulf Coast, the Texas facility will complement a similar facility that is being built on the coast of Massachusetts. NREL has also recently signed agreements with Siemens Power Generation and First Wind, a wind power developer. Siemens is launching a new research and development facility in nearby Boulder, Colorado, and has agreed to locate and test a commercial-scale wind turbine at NREL's National Wind Technology Center (NWTC). First Wind (formerly called UPC Wind Partners, LLC) owns and operates the 30-megawatt Kaheawa Wind Power farm in West Maui, Hawaii, and has agreed to let the NWTC establish a Remote Research Affiliate Partner Site at the facility. The Maui satellite of NWTC will collaborate with First Wind on studies to develop advanced wind energy technologies, including energy storage and integration of renewable electric power into Maui's electrical grid. In 2010, the DOE awarded $60 million for a study of transmission requirements. Beginning in 2006, the DOE is required to provide a transmission congestion report once every three years. Recent U.S. policy has generally been to provide an inflation-adjusted federal production tax credit (PTC) of $15 per MW·h (in 1995 dollars) generated for the first ten years of operation for wind energy sold. As of 2015, the credit was $23 per MW·h. Renewable portfolio standards mandating a certain percentage of electric power sales come from renewable energy sources, which are in place in about half of the states, also have boosted the development of the wind industry. Each time Congress has allowed the production tax credit to expire, wind power development has slowed as investors wait for the credit to be restored. Each year it is renewed, development has expanded. The tax credit expired at the end of 2012, bringing wind power development activity to a near halt. A short term, one year policy was enacted at the beginning of 2013 which provides a tax credit to projects under construction by the end of 2013 and completed before the end of 2014. The PTC was first introduced in 1992. When it was allowed to expire, development dropped 93%, 73%, and 77% the following year. The Energy Information Administration has reported that wind power received the largest share of direct federal subsidies and support in fiscal year 2013 (the latest year for which statistics are available), accounting for 37% ($5.936 billion) of total electric power related subsidies. Almost three-quarters of wind energy subsidies in that year were direct expenditures and largely resulted from the ARRA programs. These figures do not include subsidies and supports from other levels of government. The development of wind power in the United States has been supported primarily through a production tax credit (PTC), which pays producers on the amount of electric power produced. On January 1, 2013 the production tax credit was extended for another year. In late 2015 authorities provided an extension of the Production Tax Credit. The extension phases out the credit over a period of five years. The 30 percent wind and solar tax credit will extend through 2019 and then taper to 10 percent in 2022. The average price of Power purchase agreements was $23.5/MWh in 2014. Operating expenses were estimated to $10/MWh. Landowners typically receive $3,000 to $5,000 per year in rental income from each wind turbine, while farmers continue to grow crops or graze cattle up to the foot of the turbines. There is competition for wind farms among farmers in places like Iowa or ranchers in Colorado. Farmers, with no investment on their part, typically receive $3,000–5,000 per year in royalties from the local utility for siting a single, large, advanced-design wind turbine. Landscape and ecological issues may be significant for some wind farm proposals, and environmental issues are a consideration in site selection. Worldwide experience has shown that community consultation and direct involvement of the general public in wind farm projects has helped to increase community approval, and some wind farms overseas have become tourist attractions, like the Ten Mile Lagoon wind farm. Offshore development is hindered by relatively high cost compared to onshore facilities. Several projects are under development with some at advanced stages of development. The United States, though, has very large offshore wind energy resources due to strong, consistent winds off the long U.S. coastline. The 2011 NREL report, Large-Scale Offshore Wind Power in the United States, analyzes the current state of the offshore wind energy industry. According to the report, offshore wind resource development would help the country to achieve 20% of its electric power from wind by 2030 and to revitalize the manufacturing sector. Offshore wind could supply 54 gigawatts of capacity to the nation's electrical grid, thereby increasing energy security. It could also generate an estimated $200 billion in new economic activity and create thousands of permanent jobs. NREL’s report concludes that "the development of the nation’s offshore wind resources can provide many potential benefits, and that offshore wind energy could play a vital role in future U.S. energy markets". Coastal residents have opposed offshore wind farms because of fears about impacts on marine life, the environment, electric power rates, aesthetics, and recreation such as fishing and boating. However, residents also cite improved electric power rates, air quality, and job creation as positive impacts they would expect from wind farms. Because the bases of offshore turbines function as artificial reefs, studies have shown that after the initial disturbance of construction, local fish and shellfish are positively affected. Because wind turbines can be positioned at some distance from shore, impacts to recreation and fishing can be managed by careful planning of wind farm locations. Five exploratory leases for wind power production on the Outer Continental Shelf offshore from New Jersey and Delaware were issued in June 2009 by the Secretary of the Interior. 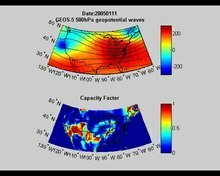 The leases authorize data gathering activities, allowing for the construction of meteorological towers on the Outer Continental Shelf from six to 18 miles (29 km) offshore. Four areas are being considered. On February 7, 2011, Salazar and Steven Chu announced a national strategy to have offshore wind power of 10 GW in 2020, and 54 GW in 2030. Projects are under development in areas of the East Coast, Great Lakes, and Gulf coast. Massachusetts and Rhode Island have strong offshore wind resources. Rhode Island and Massachusetts state officials picked Deepwater Wind to build a $1.5-billion, 385-megawatt wind farm in federal waters off Block Island. The 100-turbine project could provide 1.3 terawatt-hours (TW·h) of electric power per year – 15 percent of all electric power used in the state of Rhode Island. In 2009, Deepwater signed an agreement with National Grid to sell the power from a $200-million, 30-MW wind farm off Block Island, at an initial price of 24.4 ¢/kW·h. Construction of the Block Island Wind Farm, a five turbine project began in April 2015. Cape Wind started development around 2002, but faced opposition and eventually ceased before being realized. The floating VolturnUS operated in Penobscot Bay near Castine from June 2013 to November 2014. Maine Aqua Ventus intends to have two floating 6 MW turbines in operation off the coast of Monhegan Island by the end of 2020. Each turbine will be supported on a VolturnUS floating concrete hull. To promote wind power in New Jersey, in 2007 the state awarded a $4.4 million contract to conduct an 18-month Ocean/Wind Power Ecological Baseline Study, becoming the first state to sponsor an ocean and wind power study before allowing renewable energy developers to study and build off its shores. The study focused on a designated area off the coast to determine the current distribution, abundance and migratory patterns of avian species, fish, marine resources and sea turtle use of the existing ecological resources. The results of the study were released in June 2010. The study concluded that the effects of developing offshore windfarms would be negligible. In 2008, new federal rules greatly expanded the territory offshore wind parks can be built. Previously, projects were only allowed in shallow state waters within 3 nautical miles (5.6 km) of shore. The edge of U.S. territory is about 200 nautical miles (370 km) out. Increased distance from the coast diminishes their visibility. Waters off the coast of the United States are deeper than in Europe, requiring different designs. Atlantic Wind Connection is a proposed electrical transmission backbone to be built off the Atlantic Coast of the United States to serve offshore wind farms. The transmission line, proposed by Trans-Elect Development Company, would deliver power ashore in southern Virginia, Delaware, southern New Jersey and northern New Jersey. As a first of its kind project, it poses significant risks of encountering unexpected technological challenges and cost overruns. Such an offshore backbone is an element in the national electric power strategy. Bechtel has been selected as the EPC contractor and Alstom as technical advisor for the first phase of the development for the project. Google and Good Energies, an investment firm, are the major investors in the $5 billion project. Upper: the propagation of transient waves. Lower: the time and spatial variation of the related capacity factor values (CF) at 100m. The power curves and technical parameters for the GE 2.5 MW turbines is used to calculate the instantaneous capacity factor. Winds in the Central plains region of the U.S. are variable on both short (minutes) and long (days) time scales. Variations in wind speed result in variations in power output from wind farms, which poses difficulties incorporating wind power into an integrated power system. Wind turbines are driven by boundary layer winds, those that occur near the surface of the earth, at around 300 feet. Boundary layer winds are controlled by wind in the higher free atmosphere and have turbulence due to interaction with surface features such as trees, hills, and buildings. Short term or high frequency variations are due to this turbulence in the boundary layer. Long term variations are due to the passage of transient waves in the atmosphere, with a characteristic time scale of several days. The transient waves that influence wind in the Central U.S. are large scale and this results in the power output from wind farms in the region being somewhat correlated and not entirely independent. Large scale distribution of wind farms significantly reduce short term variability, limiting the relative standard deviation of the capacity factor to about 45%. The correlation is highest in summer and lowest in winter. The US federal government has jurisdiction to prevent bird and bat deaths by wind turbines, under the Endangered Species Act, the Migratory Bird Treaty Act, and the Bald and Golden Eagle Protection Act. Under the 2009 Bald and Golden Eagle Protection Act, the Interior Department could issue permits to allow "non-purposeful take" for activities where eagle deaths were considered unavoidable; however, as of December 2013, no take permits had been issued to wind energy developers. The United States Fish and Wildlife Service has published voluntary guidelines for design and siting of wind turbines to minimize bird and bat deaths. In 2013, the Obama administration was accused of having a double standard to protect the wind industry from Bald and Golden Eagle Protection Act prosecutions, while vigorously pursuing violations by oil companies and owners of power lines. The administration refused to divulge the number of raptor deaths reported to it by wind companies, saying that to do so would reveal trade secrets. The government also ordered federal law enforcement field agents not to pursue bird-death prosecutions against wind companies without prior approval from Washington. The policy was said to be an environmental trade-off to promote renewable energy. In November 2013, the federal government obtained its first criminal conviction of a wind power operator for killing protected birds in violation of the 1918 Migratory Bird Treaty Act. Duke Energy plead guilty, and was fined $1 million, for the deaths of 160 birds, including 14 golden eagles, at two wind farms in Wyoming. The Justice Department charged that Duke had designed and sited the turbines knowing that they would kill birds; Duke noted that it had self-reported the bird deaths, and that US Fish and Wildlife Service guidelines for reducing bird deaths by wind turbines had not been issued when the turbines were built. After they were charged, Duke implemented a radar detection system, at a cost of $600,000 per year, designed to turn off turbines when approached by large birds; the company noted that the system was working, as no golden eagle deaths had been observed in more than a year of operation since the radar was installed. In December 2013 the US Fish and Wildlife Service announced that it would issue 30-year permits to wind energy projects to allow for eagle deaths; previously, permits had been available for only 5 years, but none were issued to wind projects. Under the 30-year permits, wind power developers would be required to report eagle deaths, and the permits would be reviewed every 5 years. The measure was intended to remove what was seen as legal uncertainty discouraging wind energy investments. The government said that an environmental review was not needed for the change, because it was only an administrative change. The new regulation was welcomed by the American Wind Energy Association, which said that wind power caused less than two percent of human-caused eagle fatalities, and pointed out that the rules would require extensive mitigation and monitoring of eagle deaths. The extension of eagle taking permits from 5 to 30 years was opposed by a number of conservation groups, including the American Bird Conservancy, the Nature Conservancy, the Sierra Club, the Audubon Society, and the Humane Society of the United States. More than 30,000 wind turbine locations are within federally protected bird habitats, out of which almost 24,000 lie in the migratory corridor of the whooping crane and almost 3000 in the breeding grounds of the endangered Greater Sage- Grouse. According to Dr. Michael Hutchins, the director of the American Bird Conservancy's Bird Smart Wind Energy Campaign, wind turbines present a threat to the nation's birds, and that the present permitting process is ineffective in addressing the issue. Concern about the bird deaths prompted the American Bird Conservancy and 70 other conservation organisations, to lobby the U.S. Department of Interior to develop a National Programmatic Wind Environmental Impact Statement which would identify appropriate areas for wind energy development, as well as areas where development should be avoided, but these lobbying efforts failed. Tom Vinson, the American Wind Energy Association vice president for regulatory affairs noted the ambiguity in estimation and extrapolation of various datas and also questioned the credibility of the assumptions of organizations such as American Bird Conservancy in estimating future bird deaths. Collision risks are primarily influenced by the height of the turbines and tower type. The average death count of the birds increases as the current turbine heights reaches 475 to 639 feet. The danger to the birds increase because the higher blades start penetrate the average flight height zone of the Nocturnal Migrating Birds. The harassment of any marine mammal species in U.S. waters is a violation of the Marine Mammal Protection Act of 1972 (50 CFR 18). Offshore wind developers are required to apply for a letter of authorization or Incidental Harassment Authorization with all the pertinent details of the species under potential threat from their offshore activities, the mitigation measures, and monitoring and reporting obligations. Offshore wind projects must also comply with all regulatory obligations contained in the Federally approved State coastal management plan, under the Coastal Zone Management Act of 1972, to keep in check their effect on coastal resources. ^ a b c d "AWEA 4th quarter 2014 Public Market Report" (PDF). American Wind Energy Association (AWEA). January 2014. Retrieved February 1, 2014. ^ a b "Electric Power Monthly" (PDF). Report. U.S. Department of Energy, Energy Information Administration. March 4, 2015. ^ a b c d e f g "AWEA 2016 Fourth Quarter Market Report". AWEA. American Wind Energy Association. Archived from the original on February 11, 2017. Retrieved February 9, 2017. ^ "GWEC, Global Wind Report 2015, Annual Market Update" (PDF). ^ Druzin, Rye (August 23, 2018). "Texas wind generation keeps growing, state remains at No. 1". Houston Chronicle. ^ a b c d e "US wind generation reached 5.5% of the grid in 2016". American Wind Energy Association. March 6, 2017. ^ a b c "Alta Wind Energy Center is the nation's largest wind facility". California Energy Commission. California Energy Commission. Retrieved December 12, 2016. ^ a b "Annual Wind Industry Report, Year Ending 2008" (PDF). American Wind Energy Association. 2009. pp. 9–10. Archived from the original (PDF) on April 20, 2009. ^ Corporation, Bonnier (February 16, 2017). Popular Science. Bonnier Corporation. ^ "Wind Energy Center Alumni | Wind Energy Center". www.umass.edu. Retrieved February 16, 2017. ^ Smith, D. R. (January 1, 1987). "The Wind Farms of the Altamont Pass Area". Annual Review of Energy. 12 (1): 145–183. doi:10.1146/annurev.eg.12.110187.001045. ^ "Meadow Lake Wind Farm". EDP Renewabes. Retrieved March 27, 2019. ^ Eileen O'Grady. E.ON completes world's largest wind farm in Texas, Reuters, October 1, 2009. ^ "Limon Wind Energy Center" (PDF). NextEra Energy. Retrieved April 14, 2019. ^ Ron Pernick (2012). "Clean Energy Trends 2012" (PDF). Clean Edge. p. 5. ^ "Kansas Senate chairman cuts off questions about Koch funding at energy hearing". The Wichita Eagle. ^ Dave Levinthal. "Inside the Koch brothers' campus crusade". Center for Public Integrity. ^ "The True Benefits of Wind Power". Newsweek. April 21, 2015. Retrieved February 16, 2017. ^ Shauna Theel (July 7, 2015). "Koch-funded study on cost of wind flawed throughout". American Wind Energy Association. Retrieved April 27, 2016. ^ "Electric Power Monthly" (PDF). U.S. Department of Energy. February 2013. Retrieved February 16, 2013. ^ a b "Electric Power Monthly" (PDF). U.S. Department of Energy. February 2014. Retrieved February 22, 2014. ^ "Electricity Data Browser". U.S. Department of Energy. Retrieved December 2, 2018. ^ "Wind Powering America: Installed U.S. Wind Capacity and Wind Project Locations". U.S. Department of Energy. January 19, 2012. Archived from the original on March 14, 2014. Retrieved January 19, 2012. ^ a b "WINDExchange: Installed Wind Capacity". energy.gov. Office of Energy Efficiency and Renewable Energy, United States Department of Energy. March 5, 2010. Retrieved January 24, 2017. ^ "U.S. Wind Industry Fourth Quarter 2014 Market Report" (PDF). AWEA. January 27, 2016. Retrieved March 7, 2016. ^ "AWEA 4th quarter 2013 Public Market Report" (PDF). American Wind Energy Association (AWEA). January 2014. Retrieved February 1, 2014. ^ Kingdom, Elsevier Ltd, The Boulevard, Langford Lane, Kidlington, Oxford, OX5 1GB, United. "Global wind industry statistics 2008 - Renewable Energy Focus". www.renewableenergyfocus.com. Retrieved February 16, 2017. ^ Diane Cardwell (March 20, 2014). "Wind Industry's New Technologies Are Helping It Compete on Price". New York Times. ^ a b c d "2014 Wind Technologies Market Report" (PDF). Office of Energy Efficiency and Renewable Energy, U.S. Department of Energy. U.S. Department of Energy, Office of Energy Efficiency and Renewable Energy. August 2015. Retrieved January 24, 2016. ^ US Energy Information Administration, Table 6.7B, Capacity factors, Electric Power Monthly, October 2014. ^ "New Wind Resource Maps and Wind Potential Estimates for the United States". WINDExchange, DOE. February 19, 2010. Retrieved January 24, 2017. ^ "Estimates of Windy Land Area and Wind Energy Potential by State for Areas >= 30% Capacity Factor at 80m" (.xls). National Renewable Energy Laboratory (NREL). February 4, 2010. Retrieved January 24, 2017. ^ "U.S. Wind Resource even Larger than Previously Estimated: Government Assessment" (Press release). American Wind Energy Association. February 18, 2010. Archived from the original on February 24, 2010. ^ "Alaska 50-Meter Wind Resource Map". Wind Powering America, DOE. Archived from the original on November 25, 2010. Retrieved February 26, 2011. ^ "Hawaii 80-Meter Wind Resource Map". Wind Powering America, DOE. Archived from the original on October 15, 2011. Retrieved February 26, 2011. ^ * Lu, Xi; McElroy, Michael; Kiviluoma, Juha (June 22, 2009). "Global potential for wind generated electricity" (PDF). Proceedings of the National Academy of Sciences. 106 (27): 10933–8. doi:10.1073/pnas.0904101106. PMC 2700152. PMID 19549865. Retrieved June 27, 2009. ^ Schwartz, Marc; Heimiller, Donna (June 2010). "Assessment of Offshore Wind Energy Resources for the United States" (PDF). National Renewable Energy Lab (NREL). Retrieved September 10, 2010. ^ a b "Strengthening America's Energy Security with Offshore Wind" (PDF). U.S. Department of Energy. February 2011. ^ Zehnder, Alan; Warhaft, Zellman. "University Collaboration on Wind Energy" (PDF). Cornell University. Archived from the original (PDF) on September 1, 2011. Retrieved January 23, 2012. ^ Corina Rivera Linares. "While investment may slow in coming years, plenty of transmission construction, investment happening". Archived from the original on March 21, 2016. Retrieved March 22, 2016. ^ Herman K. Trabish (February 17, 2016). "Powered by PTC, wind energy expected to keep booming despite Clean Power Plan stay". Utility Dive. Retrieved April 27, 2016. ^ Galbraith, Kate (July 19, 2008). "Texas Approves a $4.93 Billion Wind-Power Project". The New York Times. ISSN 0362-4331. Retrieved February 16, 2017. ^ "2009 Wind Technologies Market Report" (PDF). Office of Energy Efficiency and Renewable Energy, Lawrence Berkeley National Lab. August 18, 2010. Retrieved March 6, 2016. ^ EC&R Completes 780-MW Roscoe Wind Farm Renewable Energy World, 2 October 2009. ^ O'Grady, Eileen (October 1, 2009). "E.ON completes world's largest wind farm in Texas". Reuters. ^ "AWEA 3rd Quarter 2008 Market Report" (PDF). American Wind Energy Association. October 2008. Archived (PDF) from the original on March 25, 2009. Retrieved February 2, 2017. ^ "Texas operational wind plants (As of 7/06)" (PDF). Texas Renewable Energy Industries Association. Archived from the original (PDF) on December 30, 2006. ^ "California Daily Renewables Watch" (PDF). California ISO. Retrieved February 16, 2017. ^ "Overview of Wind Energy in California". California Energy Commission. May 15, 2009. Retrieved December 2, 2009. ^ a b c "U.S. Wind Energy Projects – Washington". American Wind Energy Association. July 2010. Archived from the original on December 31, 2008. Retrieved July 28, 2010. ^ Karen Ulenhuth. "MidAmerican Energy installing a concrete tower for the tallest land-based wind turbine in the U.S." Midwest Energy News. RE-AMP. Retrieved November 20, 2015. ^ "Iowa to extend wind power lead as Invenergy plans 400 MW". Utility Dive. Retrieved September 27, 2018. ^ "Wind Energy". Oklahoma Department of Commerce. Archived from the original on January 15, 2014. Retrieved January 14, 2014. ^ "Illinois Incentives/Policies for Renewables & Efficiency". Database of State Incentives for Renewables and Efficiency. U.S. Dept. of Energy. Archived from the original on July 16, 2011. Retrieved May 17, 2010. ^ "WIND ENERGY FACTS: ILLINOIS" (PDF). American Wind Energy Association. Archived from the original (PDF) on February 15, 2013. Retrieved February 17, 2013. ^ staff. "Kansas is propelling growth in wind energy". Governors Wind Energy Coalition. Retrieved January 14, 2014. ^ Utility-Scale Land-Based 80-Meter Wind Maps. WINDExchange. U.S. Dept. of Energy. Retrieved 2 February 2017. ^ a b c "The Economic Reach of Wind". www.renewableenergyworld.com. Retrieved February 16, 2017. ^ "Acciona Celebrates Completion of First Wind Turbine Production Plant in U.S." Technology For Life. January 20, 2008. Retrieved February 16, 2017. ^ "enXco Closes Financing on Shiloh II Wind Project". www.renewableenergyworld.com. Retrieved February 16, 2017. ^ "DOE Announces Effort to Advance U.S. Wind Power Manufacturing Capacity". Energy.gov. Retrieved February 16, 2017. ^ a b Wiser, Ryan H., and Mark Bolinger. "2014 Wind Technologies Market Report" page v+56. Lawrence Berkeley National Laboratory, August 2015. ^ "New Wind Power Partnerships to Benefit Industry and Nation - News Releases | NREL". www.nrel.gov. Retrieved February 16, 2017. ^ "UPC Wind Signs Agreement with Department of Energy to Establish National Wind technology Center on Maui". First Wind. April 1, 2008. Archived from the original on December 28, 2008. Retrieved December 2, 2009. ^ "Secretary Chu Announces Efforts to Strengthen U.S. Electric Transmission Networks". Energy.gov. Retrieved February 16, 2017. ^ "National Electric Transmission Congestion Study | Department of Energy". energy.gov. Retrieved February 16, 2017. ^ US Dept. of Energy, Renewable electricity production tax credit, accessed 20 July 2015. ^ Wind Power Today 2010. EERE Wind Energy Technologies Office and Water Power Technologies Office. May 2010. ^ a b Gerhardt, Tina (January 6, 2013). "Wind Energy Gets a Boost off Fiscal Cliff Deal". The Progressive. ^ "Renewable Electricity Production Tax Credit (PTC) | Department of Energy". energy.gov. Retrieved February 16, 2017. ^ "Direct Federal Financial Interventions and Subsidies in Energy in Fiscal Year 2013". Analysis & Projections. Energy Information Administration. March 23, 2015. Retrieved January 23, 2015. ^ "Forget Oil Exports—What Just Happened to Solar is a Really Big Deal". Bloomberg.com. December 17, 2015. Retrieved February 16, 2017. ^ Jones, Tim (December 11, 2007). "More farmers seeing wind as cash crop". Chicago Tribune. Retrieved December 6, 2008. ^ Lester R. Brown (2006). "Stabilizing Climate" (PDF). Plan B 2.0 Rescuing a Planet Under Stress and a Civilization in Trouble. NY: W.W. Norton & Co. p. 191. Archived from the original (PDF) on September 26, 2007. ^ "Legendary Texas oilman embraces wind power". Star Tribune. July 25, 2008. Archived from the original on July 27, 2008. Retrieved August 24, 2008. ^ Fahey, Anna (July 9, 2008). "Texas Oil Man Says We Can Break the Addiction". Sightline Daily. Retrieved August 24, 2008. ^ "T. Boone Pickens Places $2 Billion Order for GE Wind Turbines". Wind Today Magazine. May 16, 2008. Archived from the original on October 1, 2008. Retrieved August 24, 2008. ^ Star, The Prairie. "Ag Weekly". www.agweekly.com. Retrieved February 16, 2017. ^ "Gone with the wind", New Scientist, 8 July 2006, pp. 36–39. ^ "WINDExchange: Resources and Tools for Siting Wind Turbines". apps2.eere.energy.gov. Retrieved February 16, 2017. ^ a b Bollinger, Mark (August 2014). "2013 Wind Technologies Market Report". LBNL. ^ a b "Landmark Report Analyzes Current State of U.S. Offshore Wind Industry" (PDF). NREL Highlights. 2011. ^ a b c Environmental and Energy Study Institute. "Offshore Wind Factsheet". ^ Jeremy Firestone, Willett Kempton. "Public opinion about large offshore wind power: Underlying factors" (PDF). Archived from the original (PDF) on October 9, 2011. ^ Dan Wilhelmsson; et al. "Greening Blue Energy: Identifying and managing the biodiversity risks and opportunities of offshore renewable energy" (PDF). International Union for Conservation of Nature and Natural Resources. ^ "DOI Announces Five Exploratory Leases for Offshore Wind Energy". www.renewableenergyworld.com. Retrieved February 16, 2017. ^ "Areas under consideration for wind energy areas". U.S. Department of Energy. Archived from the original on February 12, 2011. Retrieved February 8, 2011. ^ Lord, Peter B. (April 24, 2009). "Deepwater wind project making headway". The Providence Journal. Retrieved April 29, 2009. ^ "Rhode Island Chooses Deepwater Wind to Build Off-Shore Wind Farm". RenewableEnergyWorld.com. September 30, 2008. Retrieved April 29, 2009. ^ Nesi, Ted (April 22, 2009). "U.S. offshore wind rules expected today". Providence Business News. Archived from the original on April 26, 2009. Retrieved April 29, 2009. ^ "SUPPLEMENT ANALYSIS 2 FOR THE SUPPLEMENTAL ENVIRONMENTAL ASSESSMENT/FINDING OF NO SIGNIFICANT IMPACT FOR THE UNIVERSITY OF MAINE'S DEEPWATER OFFSHORE FLOATING WIND TURBINE TESTING AND DEMONSTRATION PROJECT" (PDF). United States Department of Energy. United States Department of Energy Office of Energy Efficiency and Renewable Energy. Retrieved January 18, 2019. ^ "Volturnus". University of Maine Advanced Structures and Composites Center. University of Maine. Retrieved January 18, 2019. ^ "New England Aqua Ventus I - The Project". Maine Aqua Ventus. Maine Aqua Ventus. Retrieved January 18, 2019. ^ "GMI Awarded New Jersey Ocean/Wind Power Ecological Baseline Studies". North American Wind Power. November 15, 2007. Retrieved June 6, 2011. ^ "Offshore Wind Energy Study Puts New Jersey in Lead Nationally in Creating Environmentally Safer Energy Source". New Jersey Department of Environmental Protection. June 18, 2010. Retrieved June 6, 2011. ^ "Ocean/Wind Power Baseline Ecological Studies". State of New Jersey Department of Environmental Protection. July 23, 2010. Retrieved June 6, 2011. ^ Frank Maisano (January 17, 2013). "Offshore Wind Transmission Project Selects Bechtel, Alstom to Build Historic Project" (PDF) (Press release). Atlantic Grid Development, LLC. Retrieved January 24, 2013. ^ a b c Junling Huang, Xi Lu and Michael B. McElroy (2014). "Meteorologically defined limits to reduction in the variability of outputs from a coupled wind farm system in the Central US" (PDF). Renewable Energy. 62: 331–340 (p13+15+26). doi:10.1016/j.renene.2013.07.022. ^ Lu, Xi; McElroya, Michael B.; Kiviluoma, Juha (July 2009). "Global potential for wind-generated electricity: Correlation table between Montana (MT), Minnesota (MN), and Texas (TX)". Proceedings of the National Academy of Sciences of the United States of America. 106 (27): 10933–10938. doi:10.1073/pnas.0904101106. PMC 2700152. PMID 19549865. ^ a b Associated Press, "US to allow eagle deaths – to aid wind power", Washington Post, 6 Dec. 2013. ^ "Land-Based Wind Energy Guidelines" (PDF). United States Fish and Wildlife Service. March 23, 2012. Archived from the original (PDF) on May 28, 2014. ^ Dina Cappiello, "Wind farms get pass on eagle deaths", Associated Press, 14 May 2013. ^ Soumya Karlamangla, "Energy company to pay $1 million in wind turbine eagle deaths", Los Angeles Times, 24 Nov. 2013. ^ Eyder Peralta, Duke Energy Pleads Guilty Over Eagle Deaths At Wind Farms", National Public Radio, 23 Nov. 2013. ^ American Wind Energy Association, AWEA Statement on U.S. Fish & Wildlife Service's Eagle Permit Tenure Rule Archived December 11, 2013, at the Wayback Machine, 6 Dec. 2013. ^ American Bird Conservancy, Opposition to 30-Year Eagle Take Permits, accessed 8 December 2013. ^ Audubon Society, Interior Dept. Rule Greenlights Eagle Slaughter at Wind Farms, Says Audubon CEO, 5 December 2013. ^ a b c "30,000 Wind Turbines Located in critical bird habitats". ^ "Threats to birds from Wind Turbines". ^ "Wildlife protection laws and offshore wind energy development in the US". ^ "Electric Power Annual". US Energy Information Administration. Retrieved June 2, 2018. ^ "Electric Power Monthly". US Energy Information Administration. Wikimedia Commons has media related to Wind power in the United States and Wind farms in the United States.